For me, one of the delights of following royal jewels is the surprise that comes when pieces reemerge after long, mysterious absences. The Dutch Ruby Peacock Parure has given us two such surprises, once in 2009 and again in 2017. It is, therefore, time for a revisit. 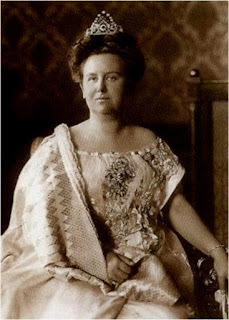 In 1897, Queen Wilhelmina of the Netherlands commissioned Johann Eduard Schürmann & Co. to make a diamond and ruby tiara using rubies that once belonged to Queen Sophie, the first wife of Wilhelmina’s father Willem III (Wilhelmina's mother was Queen Emma, Willem's second wife). 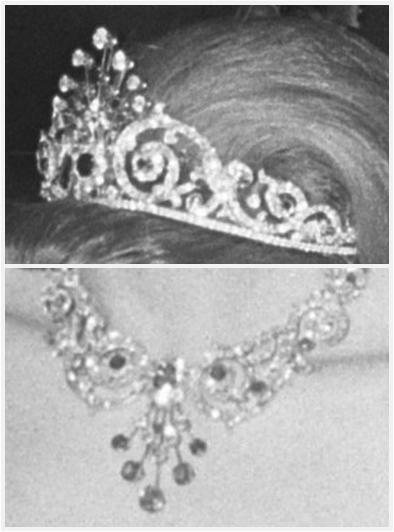 The result is this tiara filled with swirls around a central element resembling a peacock tail. The peacock motif can be removed from the tiara and worn in the hair as an aigrette. Matching jewels in the parure include a necklace, which is close to a mirror image of the tiara and can itself be worn in several configurations, and a large brooch. The pieces are often combined with jewels from the family’s other large ruby set, the Mellerio Ruby Parure. Left to Right: Juliana in the necklace and pieces of the Mellerio Ruby Parure; Irene wears the central motif as an aigrette; Irene in the tiara and brooch. Her earrings also match the set. Wilhelmina’s daughter, Queen Juliana, wore the necklace on the day she took the throne, and she also wore it occasionally as a headpiece. In the years that followed, it was Juliana’s daughter, Princess Irene, who became the Dutch royal associated most with the Peacock Parure. 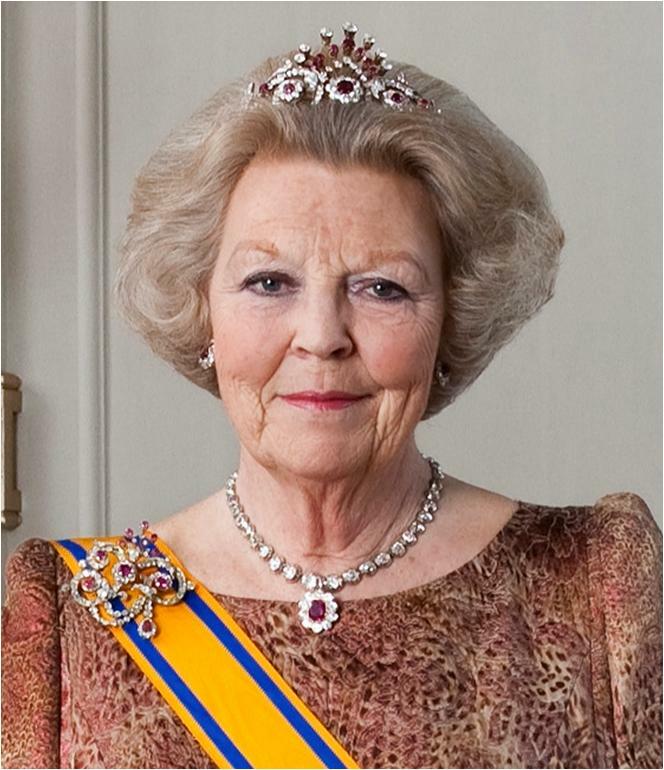 While most of the major Dutch royal jewels are wrapped up in a family foundation, it was often said that the Peacock Parure had been gifted to Irene. Princess Irene wore the parure often as a young princess and during her controversial marriage to Prince Carlos Hugo of Bourbon-Parma, but she eventually stopped wearing it. For decades, the Ruby Peacock Tiara and its necklace went unseen. Many assumed that Irene had quietly sold it at some point (as is often speculated when royal jewels disappear from public view for years on end). Leave it to Queen Máxima - who genuinely seems to love showcasing jewelry and often plays around with new combinations from the family collection - to solve the mystery. In 2009, during a state visit from Sweden, then-Princess Máxima surprised everyone by appearing in the Ruby Peacock Tiara. She has used the diadem on several occasions since, and it has also been worn by Princess (formerly Queen) Beatrix. For those interested in ownership of royal jewels, their use of the tiara seems to indicate that the set is in the family collection now, and raises questions about whether it was really gifted to Irene in the past or not. Even as the tiara made its way back into regular usage, the matching necklace remained a mystery. It also hadn't been seen in decades; was it still with the family? Once again, Queen Máxima has the answers. She wore the Ruby Peacock Necklace while hosting a dinner for the President of Germany earlier this week. Questions about the long absence of this parure may remain, but we know these pieces are still around, and that’s what counts. I hope to see the necklace and the tiara worn together again soon, because this is a set that deserves to be seen all at once. Which do you prefer: the Peacock Tiara or the Mellerio Ruby Tiara?